I want to introduce you all to a very special friend, my jester nonpareil, Alessandra: Translator, scholar, poet, insightful reader, bon vivant, fount of sprezzatura. I can’t wait until we meet face to face at last when I visit Rome this summer (all too briefly!). She tells us about one of her favourite spots in her city, one I’m sure a lot of you will love, too. Those who have been fortunate enough to visit the Eternal city have certainly found themselves reading , deciphering, questioning, interpreting , admiring and eventually falling under the spell of its breathtaking beauties. As no other city in the world, Rome may be compared to an immortal poet who — over the course of the millennia — has been very busy penning probably the most spectacular of all poems on its unparalleled monuments and dipping the nib in deep, rich hues, such as pink and ochre. A native to this spectacular city, I myself cannot help being seduced on a daily basis by the ethereal grace and the poetical nature of the places that surround me. Given my love for poetry, I would like to introduce you to one of the most poetical places that this city holds in her very heart. A place full of wonders. A sort of secret garden which invites people to spend one’s time absorbed in deep contemplation and reveries. Many will probably fret at my choice, since it is the least roman — not to mention the fact that it is also the least catholic — of all the monuments. Some would probably not even consider it as a monument in its own right. 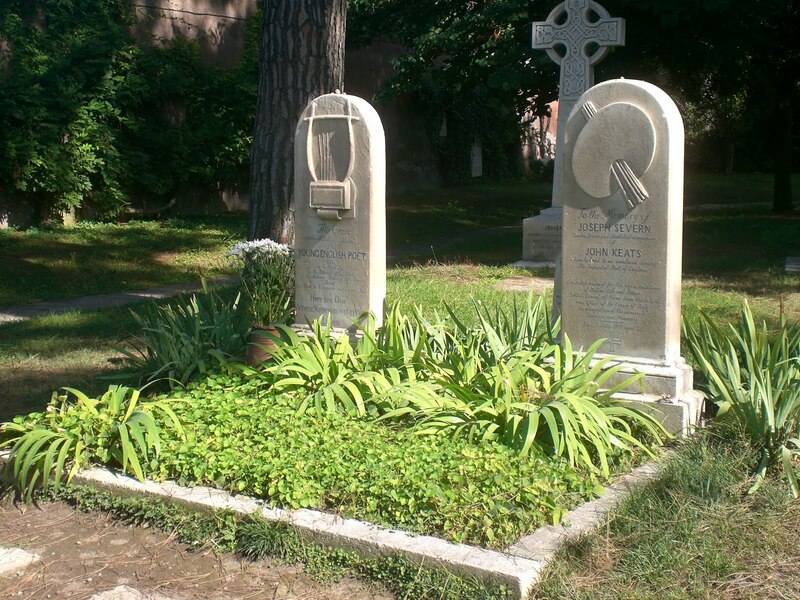 But, despite all, this cannot be helped: the Protestant Cemetery of Rome is the one that holds such a special place in my heart, so much so as to make it my absolute favourite spot. You may wonder why a cemetery could be deemed by any roman as the very epitome of charm and poetry. Well then, you will have to allow me to be your guide to this place, so that you may be able to see it — albeit fleetingly — through my very eyes. No other cemetery in the world that I have ever visited inspires such a sense of infinite peace, hope and awe. In the august shade of the Pyramid of Cestius, amidst cypress pines, myrtle and laurel, wild roses and flaming camellias, 4,000 men and women of all races and nations, languages and ages sleep their final sleep here together. And among them, two of the most gifted English Romantic poets, John Keats and Percy B. Shelley. 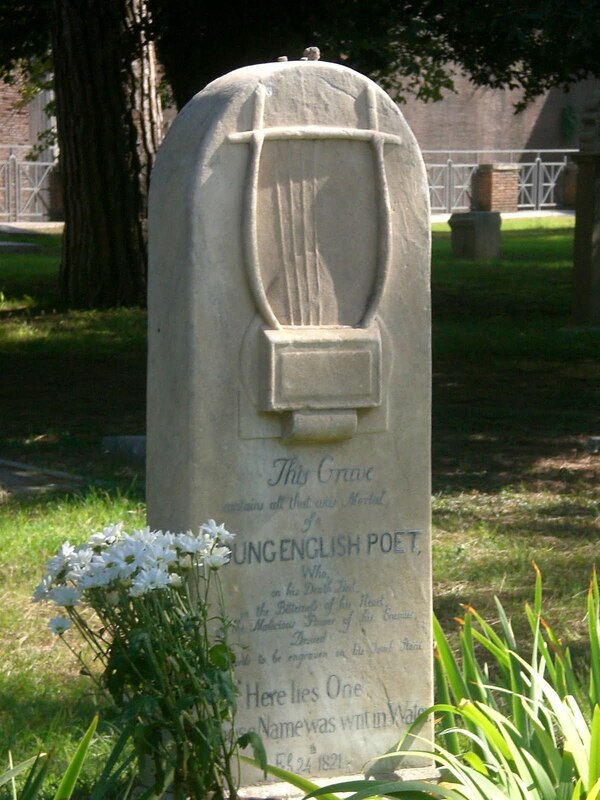 The very spot where John Keats rests is perhaps the most beautiful of the whole cemetery. The rich meadow that surrounds it is dotted by very few tombs and roman ruins. At the backdrop, the shape of the pyramid lies still as if guarding it. The 27-year-old poet, as he was dying of consumption, in the small palazzo close to the Spanish Steps, would question his dear painter friend Severn as to how the place where he was to be buried looked like. The answer had seemed most appealing to his ears, upon learning that the very place was rich with grass and flowers, including innumerable violets. Approaching his tomb, we can now rest our eyes on the engraved epitaph: “This grave contains all that was mortal of a young English poet, who, on his death-bed, in the bitterness of his heart at the malicious power of his enemies, desired these words to be engraved on his tombstone : ‘Here lies one whose name was writ in water.’” Fame and life are fleeting like the powerful words that Keats himself chose. This might explain the reason why he did not want his name to leave a trace anywhere including his own gravestone. Following the path that leads back to the monumental area of the cemetery and skirting the pyramid, one is greeted by the merry presence of the many roman felines that have chosen this place as their abode. As we walk uphill, along the walls through a narrow passageway, our eyes will remain bedazzled by the impressive weeping angel carved by sculptor William Wetmore for his own and his beloved wife’s tomb. A few steps further still and on the left , we won’t fail to notice a white tombstone shaded by a giant statuesque pine tree which reads “Percy Bysshe Shelley COR CORDIUM” followed by a Shakespearean quote from The Tempest: “Nothing of him that doth fade/But doth suffer a sea-change/Into something rich and strange.” The ashes of the “heart of hearts,” drowned in the Gulf of La Spezia at the age of thirty, rest here. The poetical words pronounced by Ariel do touch the heart. Shelley’s fame and fate resound like an echo in those words. Many lovely afternoons have I spent here wandering in the sun, in the shade, or simply sitting on a bench reading verses. The grace of this place, with its austere or beautifully decorated tombs bearing angels and statues of all kinds and shapes, brightened by the singing birds, the flutter of butterflies, the intense hyacinths or the dozing cats, is unique. Many a time have I whispered here John Donne’s powerful words: “Death thou shalt die.” Indeed so. Because poetry will live eternally, carved on the tombstones and in the hearts — now ashes — of the poets that rest in this place forever and ever. Thanks, Jack! I can't wait — I would love to travel all around Italy, but I will have to wait until I find a more successful path for my writing, I think. Or win the lottery! Locating my inner Snufkin to make it easier to be free. Hey, Dana, Todd — thanks for stopping by! And Jack for stopping back!This will be my first visit to Italy; with luck it won't be the last. My brother's been there before and just adored it. My head is of course full of Merchant Ivory films so I shall have to consider my wardrobe carefully.I'm envious of your experiences, Dana and Jack — happy to hear recommendations, too.Todd, I can't get over the insanity of those cases. Writers and editors are clearly dangerous people [insert eye roll]. Kate, you are going to love Rome. I was there in 1970 so things may have changed a bit by now. But the city, itself, surely remains as beautiful and redolent of the past two millenia as it ever was.Dana, I recall your post on Italian gelato. Kate is in for a real treat.Please say hello to signora (or signorina) Bava for me. And enjoy yourself. You have earned it.LOL. Aw thanks, Jack! I appreciate it. And I am lucky to have a native guide like Alessandra to show me around. I will see the hidden gems of Rome! The Protestant Cemetary is an oasis of quietude in an otherwise very busy part of the city. Enjoy, and leave a few euros for the kitties before you leave. Also, you might be interested in the Keats-Shelly museum near the Spanish Steps, as well as Babbington's Tea Rooms — like every other displaced Londoner! LOL — you know me so well! That sounds perfect. I know I won't be able to see much in a short trip, but that sounds like a manageable tour.